Major plans have been submitted for a “world class” golf course which could make the Highlands Scotland’s third major golfing destination and generate hundreds of local jobs. Work could start on the £8-10 million project – bordering Loch Fleet and the North Sea – next Spring with a view to opening fully in March 2021. And Mr Warnock revealed that Coul Links would be part-owned by The Embo Trust, which has already committed a £5,000 equity investment to be matched 5-1 by Mr Keiser to “guarantee a local income stream for generations”. Mr Warnock has also brought in former Castle Stuart head greenkeeper Chris Haspell as project manager to “enhance” the environment of the Coul Links Site of Special Scientific Interest (SSSI), 1.8% of which would become golf course. And an economic study done by BiGGAR Economics, analysed by Highlands and Islands Enterprise, estimates that Coul Links would create 250 indirect jobs and add £60 million to the East Sutherland economy alone – 450 jobs and £85 million for the Highlands – in its first 10 years. 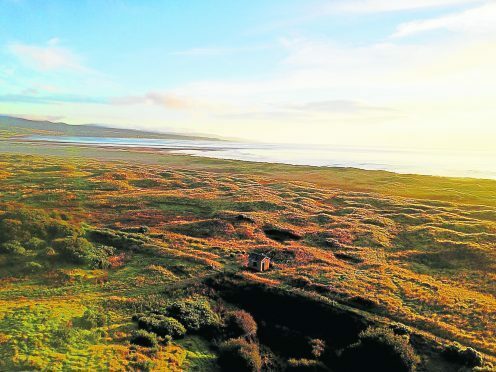 Mr Warnock said previously that Coul Links would reverse a trend of golfers coming to play Royal Dornoch for a day but returning to their Inverness base, and not staying and playing golf at other courses such as Brora, Golspie and Tain. Mr Warnock told The Press and Journal of his “tremendous excitement” at filing the application, adding: “We can’t just build a golf course. We have to build a truly special, world class golf course. Mr Warnock said that 34.6 acres of the course would be on the SSSI, with 21.5 acres falling outside its boundary. The developers have agreed to remediate 14 acres of a felled tree plantation within the SSSI as part of the golf course which they say SNH has deemed “environmentally compromised”. Mr Warnock also revealed that his team found the apparently rare Fonseca Seed Fly, which threatened to halt theplans, “in quantity” at Coul Links, and has agreed to fund the first comprehensive habitat studies of the species using PhD researchers. Public consultation events on the new plans will be held on October 22 in Embo and October 23 in Dornoch. Mr Warnock and Mr Haspell have encouraged all opinions to be shared with Highland Council, whether for or against the golf course. Coul Links: What will it look like? The course would be shaped from the natural contours of the land. Its primary dune and heather features would resemble Northern Ireland’s Royal County Down and Royal Port Rush golf courses, along with their similar sea and mountain backdrops. Golfers playing Coul Links will come to the sea on the 15th green, 16th tee, 17th green and 18th tee, where there will be a full view along Embo beach and to Loch Fleet. The 2nd, 3rd and 4th tees will also be located in and around Loch Fleet next to marram grass and gorse, with views out towards Ben Bhraggie. The course construction will be led by Chris Haspell and world renowned architects Bill Coore and Ben Crenshaw, who say that in 31 years of their profession they have worked on no site more special than Coul Links. Thirty-six holes could be played on two world class courses in a day, with shuttle buses taking golfers there from Royal Dornoch after lunch – and there could be future potential to link this service up to courses at Brora, Golspie and Tain. And Mr Warnock states in his plans that there will be no hotel or real estate development at Coul Links. Stonebuilt crofthouses built in the 1800s, all outside the SSSI, will be converted into the pro shop and admin building, caddie shed and maintenance shed. No decision has been taken to build a clubhouse initially but, if that changes, it would be consistent with this authentic design. Up to 100 jobs – management, admin staff, ground staff, caddies and pro shop staff – would be created at the course. A former railway station, now a bothy, would be converted to an environmental education centre containing maps of local paths and give information on the coastal history, culture and ecology of the area.